Christmas is fast approaching and if you’re like the majority of people, finding the perfect Christmas gift for your loved ones can be very difficult. What if the gift you bought them this Christmas was a confident smile? 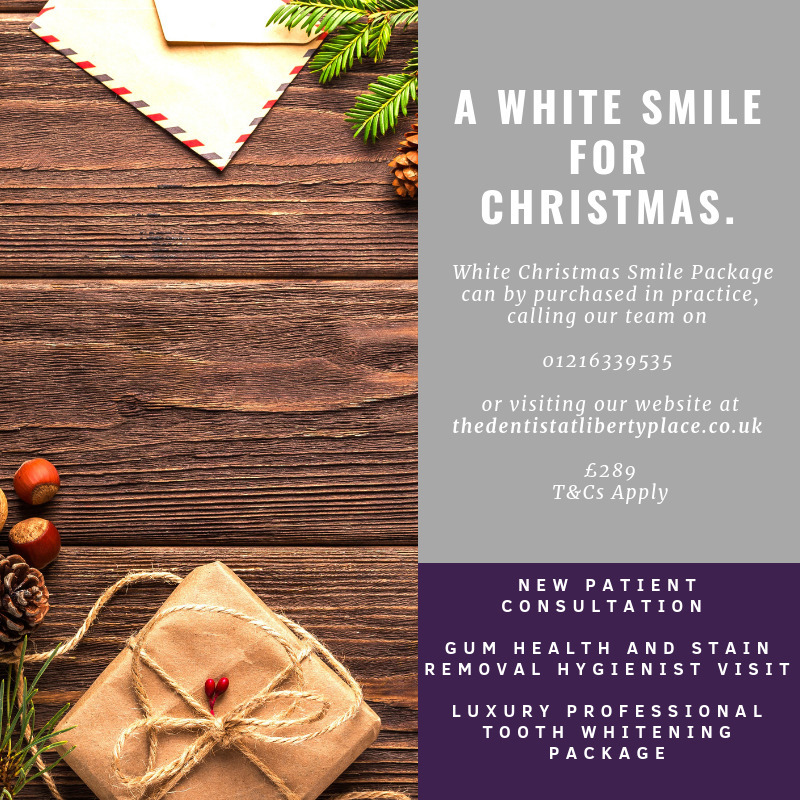 At The Dentist at Liberty Place, we are offering a very special offer to enable you to put a smile on someone’s face this Christmas. You can give the gift of a beautiful smile for just £289. With our Christmas Smile Package the receiver will be invited for a full consultation with one of our experienced cosmetic dentists. At this 40 minute visit, their dentist will fully assess both the health of their mouth and how happy they are with their smile. Following this, they will see our hygiene team who specialise in the health of gums, cleanliness of teeth and stain removal leaving your teeth sparkling. They will then begin the process to a whiter smile forever with our luxury home tooth whitening package to transform their smile professionally. What does our Christmas Smile Package include? As an existing patient of The Dentist at Liberty Place, you are entitled to be able to purchase this special package for a recipient who would be a new patient of ours. New patients can even treat themselves to this great offer. For just £289, you will benefit from a New Patient Consultation (worth £49.50), a Gum Health and Stain Removal visit with one of our hygienists (worth £81.60) and a Luxury Home Tooth Whitening package (worth £299). Once this offer has been purchased, it must be booked in by the end of March 2019. Contact us here or call the practice on 0121 633 9535 for more information on this amazing offer. Find out more about our Teeth Whitening treatment here.